Photo via City of Santee’s Facebook. 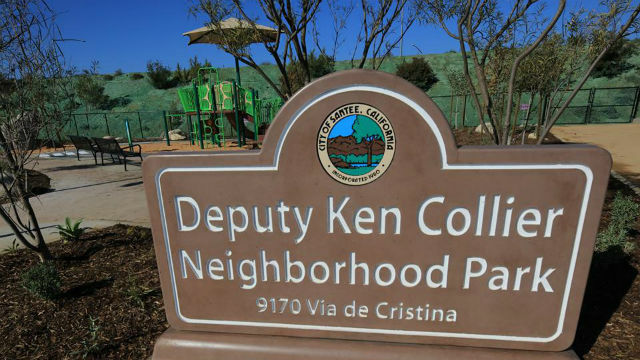 Deputy Ken Collier Neighborhood Park opened in Santee Saturday, following a ribbon-cutting ceremony with city and sheriff’s officials. The half-acre park in the 9100 block of Via de Cristina was named in memory of Collier, who was killed in the line of duty while trying to stop a drunk driver going the wrong way on Highway 52 in Santee in 2010. It has two playgrounds made from recyclable materials, a half-court basketball court, outdoor exercise equipment, benches and a picnic area. The park also features drought-tolerant trees and shrubs, as well as solar-powered overhead lighting. The project cost $1.2 million, including design and engineering. State and local grants helped offset some of the cost, according to Santee officials.